This project is a response to a competition to design a culture center at the site in Afghanistan where the two colossal stone Buddha statues were destroyed by the Taliban in 2001. Located past a village of courtyard structures, this cultural center stretches itself out to the edge of the canyon. One enters the center halfway down a gently descending exterior ramp bringing the visitor into a gallery space with a gently sloped exhibit hall. The end of the hall is clad in glass with a commanding view of the vandalized monuments across the valley floor. The building is constructed of rammed earth and is suppressed within the landscape until it reaches the edge of the canyon where the gallery and auditorium, with their view out to the monument site break way form the ground plane. 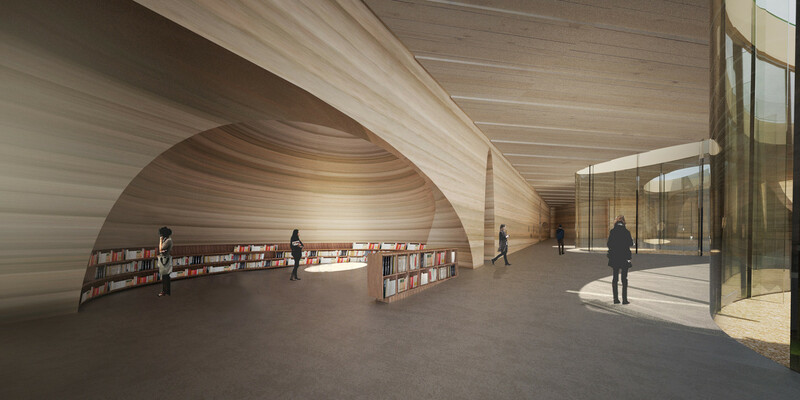 Inside the center, programmatic spaces such as the bookstore and recital spaces are carved out of the rammed earth mimicking the construction of the colossal carved Buddha’s across the valley floor. The jury was impressed with the quiet sophistication of the design and the deliberate desire to make the architectural construction of the center reference the context of this historic cultural site.